Sprint Planning is one of the well-known “ceremonies” within the Scrum framework. While at Pragmateam we absolutely see the value in planning, we typically approach Sprint Planning from the perspective of flow. 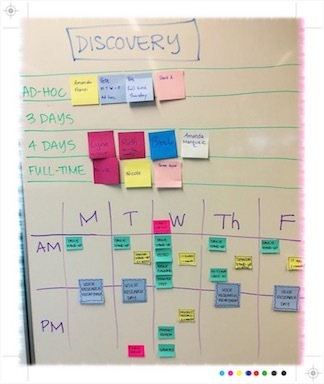 The question we want to answer during sprint planning: How do we use the weekly/fortnightly conversation to continue the momentum of the previous sprint? Death by tooling - work around perceived restrictions imposed by the tool being used (be it JIRA, Trello or post it notes) rather than having a good discussion about meaning, priority and complexity. The team usually plans in the morning, so we skip the daily stand up. We walk the wall from right to left. Everyone gives an update on what they achieved and moves any remaining items to 'Done' - mostly accompanied by celebratory clapping. Some teams also estimate the work, so we count our story points, and talk about our velocity compared to the previous sprints. What has been achieved? What hasn’t? What have you learned about your velocity? Celebrations are important. The next step is to look at the longer term plan to understand how far we have progressed along it with the previous sprint. Where are we now? Where are we heading? Are we still heading in the right direction? What did we learn that impacts our longer term plan? Sprint goals are a great way to focus the planning session. They help prioritise and say ‘No’ to incoming requests or to discussions that derail us, e.g. “And what about this one?" . It’s usually the Product Owner who shares their 2-3 sprint goals first. Everyone chimes in and clarifies the goals until the team agrees on priority and potentially also stretch goals. What is it you want to be able to show at the next showcase? What would make the team proud given the timeframe? What’s the theme of this sprint? If we had the time, what would be the next best thing to pick up? Before we prioritise the work, we understand who is available in the team for the next sprint. Every team has a lo-fi calendar in their team space with the main ceremonies, reflecting if people are in or out of the office. Who is on leave, in conferences, or has other commitments? How does that affect our capacity? 5. What's the work to be done? Once we are clear on sprint goals and our available capacity, we discuss items that we haven't achieved in the previous sprint. If they are still a priority for this sprint based on what we have learned, commit to them now. Otherwise, we push them back into our backlog. Then we add everything that is still required to achieve the sprint goals. There are endless ways to size the work. Whatever your technique, the conversation about the complexity of the piece of work we are committing to - and how much we know or don’t know about it - is super important. What is currently in "Doing' that you still need to finish? What are the priorities that help you achieve the sprint goals? Which of the items in the backlog contributes to achieving the sprint goals? Are there any gaps? What is the 'bang for buck' for the stories? Compared to our previous velocity, can we commit to the amount of work? The team then takes a step back and looks at what they have pulled together. We look at our sprint goals, priorities, the team capacity and how the size of the work compares to our previous velocity. If the team has a very high confidence of achieving all sprint goals, then we have a conversation about whether there is an opportunity to add a stretch goal. If there’s no confidence whatsoever, we revisit our priorities. Given your capacity, previous velocity, sprint goals and size of the work, can we actually achieve our sprint goals? How confident are we in achieving these goals? 7. What can we do better next time? A question that should be at the end of everything we do. While these topics seem very rigid and a lot to cover in 45min, it is often a fairly straightforward conversation. Celebrating today, looking back, looking forward, breaking plans into workable chunks, checking capacity and confidence, closing. Preparation by the Product Manager and team members is key. The other - often overlooked - ingredient to a good planning session is the willingness of everyone to make it so. If everyone expects and works for the session to be effective, the group will carry the session along.